Imphal, April 15: In a tragic incident, three women were killed after a storm hit Kakching and Churachandpur districts of Manipur. Several houses were also reported to be damaged in the storm. The northeastern states of India have been witnessing moderate to heavy rain and thundershowers for the last two days. According to Skymetweather report, in the last 24 hours, Barapani recorded 26 mm of rain, followed by Shillong 24 mm, Cherrapunji 12 mm, Goalpara 8 mm, Mazbat and Pasighat 6 mm. The India Meteorological Department (IMD) has issued a warning of thundersquall with a wind speed of 60-70 km per hour at isolated places over Assam, Meghalaya, Nagaland, Manipur, Mizoram and Tripura. The IMD on Sunday also predicted a rough-weather in North and Northwest India for the next three days. 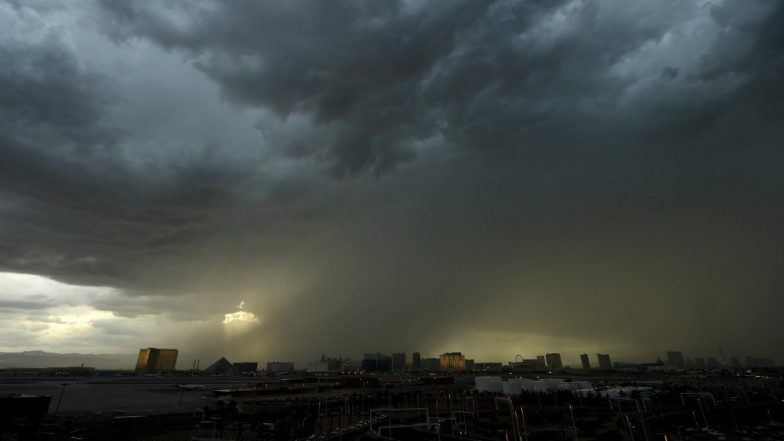 The official weather forecast agency issued a statement claiming that dust storms, rains and thundershowers are likely to hit parts of Delhi, Haryana, Punjab, Rajasthan, West Madhya Pradesh and West Uttar Pradesh. Travel Tip of The Week: Wayanad to Shillong, 6 Hill Stations in India That You Should Visit to Feel The Chill This Summer. The IMD warning comes amid rainfall being witnessed in some Northeastern, central and southern states over the last couple of days. Thunderstorms were witnessed in Bihar, Kerala, Jharkhand and Telangana, along with the interiors of Karnataka and Maharashtra on Saturday. Meanwhile, air quality is likely to be poor in Mumbai and Delhi.